Park Shin Hye and Jung Yong Hwa's "Heartstrings" Japanese fan meeting was sold out. "Heartstrings" was aired earlier this year on cable TV, MNET. From its first broadcast, the drama was sensationally popular in Japan which later was number one on Tsutaya's DVD rental chart. This month, the drama will be broadcast on Fuji TV. On July 16th, at the Tokyo International Forum, starring Park Shin Hye and Jung Yong Hwa, two sessions of the fan meeting will be held. Once at 1pm and another at 5pm, each seating over 5000 people. The seats were already out sold. Park Shin Hye and Jung Yong Hwa will highlight "Heartstrings" to fans via videos as well as talk and interviews. They are also preparing a special performance for the fans. 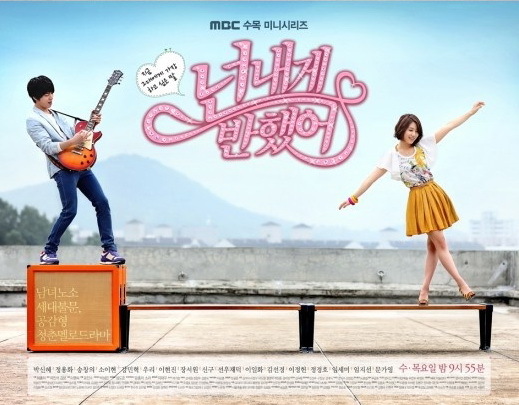 "Heartstrings" was aired last summer from June until August via MBC. The drama's rating was below 10% domestically. But in Japan, the drama was a great success. Many fans were looking forward to the pairing of Shin Hye and Yong Hwa after "You're Beautiful" aired in Japan. its always fun to see them together..they always brighten up my day..
Good luck, Dooley Couple! Can't wait for the HS FM..
cant wait to look at the pictures lol xDD <3 heartstrings!! I'm really delighted to hear that FM tickets are already SOLD OUT!!!! I can't wait to see them together in FM.FIGHTING FOR THE FAN MEETING- EMOTIONAL DOOLEY COUPLE!! !Furthermore, It would be great if Shin hye sis make a appearance as a guest in RUNNING MAN variety show!!!!! I agree with you, it would be awesome to see her in Running Man variety show..i also have another wish- that cnblue guests in Hello Baby with shinhye as guest- this would be hilarious!!!!!!!! Very happy for both our Princess PSH & Prince JYH. Both are meant for each other not as Good friends but Couple. Hopefully will end up as one. Pls support both of them & request for BOTH of them to be lead again in a Dramas. They are really compatible. Looking forward to see them again pairing up as Couples in a Dramas. I repeatedly watch "Heartstring". I am slowly convinced that shin-hye and hyong wha looks are similar. And what I like most is the way jyh handles shin-hye---very sweet and HE'S A GENTLEMAN! even what happened in Paeksang Awards Night, very sweet and unassuming. And I find jyh song compositions for heartstring were really expressions of what is in his heart towards shin-hye... love it...AND VERY CONVINCING WHEN HE SANG! It's not just acting or two sweet than real. I could see his eyes...not just acting.... but penetrating.... and his manners and attitudes. You could see how he treasures shin-hye and if you look closely more... he is really handsome!